This Listing is for One, LED Light Flurries COLOR Snowflake Projector. 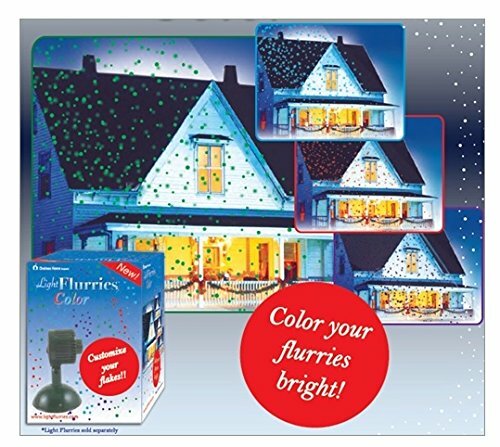 (NEW for 2014 - Doubles the Light - Doubles the Flurries with 4 Colors) The Light Flurries Colors will double the effect of your Light Flurries snowflake projector with a second LED lamp with either Purple, Blue, Red or Green lights. Just push the button on the lamp to shower your house with red, blue, purple or green light flurries. Colors adds up to 300 more Lumens of light on your house. The Light Flurries Color includes a Y-Splitter cable that enables you to plug in the both spotlights. If you have any questions about this product by Chelsea Home Imports, contact us by completing and submitting the form below. If you are looking for a specif part number, please include it with your message. LED Laser Christmas and Holiday Lights Projector for Outdoor & Indoor Use. Use All Year for Parties & Holidays!